Thermoplasma acidophilum. Linda Stannard, UCT/Photo Science Library. Thermoplasma was first isolated in the 1960s, in a coal pile in Indiana. Thermoplasma is a thermophile, meaning that it grows best in hot environments, usually between 55 and 60 degrees Celsius. This genus is most famous for its acidophilia, preferring pH range of 0.5-4. Thermoplasma cells lyse at a neutral pH. In 2001, the genome strucutres of both Thermoplasma acidophilum DSM 1728 and Thermoplasma volcanium GSS1 were sequenced. Until the genome was sequenced, Thermoplasma was believed to belong to the Eukaryotes. T. acidophilum contains 1,564,905 base pairs; it is one of the smallest genomes ever sequenced. Despite its size, there are 68 proteins that do not exist in any other archaeal genome. This genome lacks some characteristics as well. For example, although Thermoplasma have flagella, no chemotaxis protein has been found. In addition, Thermoplasma genes that reduce sulfur resemble those of bacteria instead of other archaea. The irregular shape Thermoplasma takes in a liquid. Photo by Dr. William Hixon. 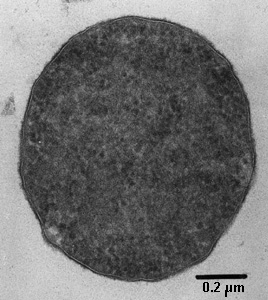 Like all archaea, Thermoplasma are unicellular. Despite living in acidic environments, Thermoplasma lack cell walls. They are contained only by plasma membranes which consists of diether and tetraether lipids. In addition, Thermoplasma are not nucleated. The shape of these cells can be filamentous or coccoid, or they can take the form of a disc or club. Thermoplasma are flagellated. Thermoplasma show an irregular form when placed in water, and become spheres at room temperature. Thermoplasma are heterotrophic organisms. They are capable of obtaining energy in anaerobic environments via sulphur respiration. Thermoplasma are also scavengers, eating organisms that cannot survive in a highly acidic environment. "Pisciarelli Solfatara," a solfataric area in Naples, Italy, which harbors Thermoplasma. Huber and Stetter, "Thermoplasmatales." Thermoplasma are found in self-heating coal waste piles, although this is not a natural habitat. 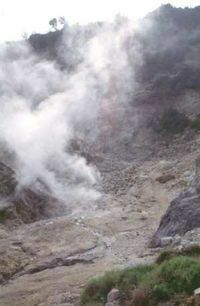 They are typically found in hot springs, as well as solfataric fields. 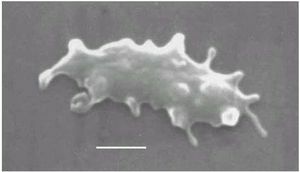 Thermoplasma acidophilum can be employed as a model organism for scientific research, partially because this species has a strong evolutionary relationship to eukaryotes. DeLong, Edward F. "Extreme Genomes." Genome Biology. 2000, 1(6):1029.1–1029.3. Goettig, Peter, Michael Groll, Jeong-Sun Kim, Robert Huber, and Hans Brandstetter. "Structures of the tricorn-interacting aminopeptidase F1 with different ligands explain its catalytic mechanism." The EMBO Journal. 2002;21(20):5343-5352. Huber, Harald and Karl O. Stetter. "Thermoplasmatales." The Prokaryotes. Release 3.8 Accessed 5 August 2005. Kon, Takahide, Naoki Nemoto, Tairo Oshima, and Akihiko Yamagishi. "Effects of a Squalene Epoxidase Inhibitor, Terbinafine, on Ether Lipid Biosyntheses in a Thermoacidophilic Archaeon, Thermoplasma acidophilum. "J Bacteriol. 2002 March; 184(5): 1395–1401. Li, Jing Yan and Chuan Fen Wu. "Perspectives on the origin of microfilaments, microtubules, the relevant chaperonin system and cytoskeletal motors - a commentary on the spirochaete origin of flagella." Cell Research. 2003;13(4):219-227. Max Planck Society. "What are 'Life-Stye' Genes? : Some microorganisms like it not only hot but also extremely acidic/'life-style' genes enable cells to adapt to extreme environments. "28 September 2000. Accessed 4 August 2005. Mayr, Jutta, Huei-Rong Wang, Petra Nederlof, and Wolfgang Baumeister. "The Import Pathway of Human and Thermoplasma 20S Proteasomes into HeLa Cell Nuclei Is Different from That of Classical NLS-Bearing Proteins." Biol. Chem., Vol. 380, pp. 1183 – 1192, October 1999. Ruepp, Andreas et. al. "The genome sequence of the thermoacidophilic scavenger Thermoplasma acidophilum." Nature. 28 September 2000;407:508-513. Suckow, Joerg Michael. "DNA-Recognition by the TATA box-binding protein of a hyper-thermophilic archaeon." Accessed 4 August 2005. Thermoplasma Genome Project Pages. 12 February 2002. Accessed 4 August 2005. Trivedi, Bijal P. "Thermoplasma acidophilum: Living the hot, acidic life." Genome News Network. 29 September 2000. Accessed 4 August 2005. This page was last edited on 6 August 2010, at 21:16.